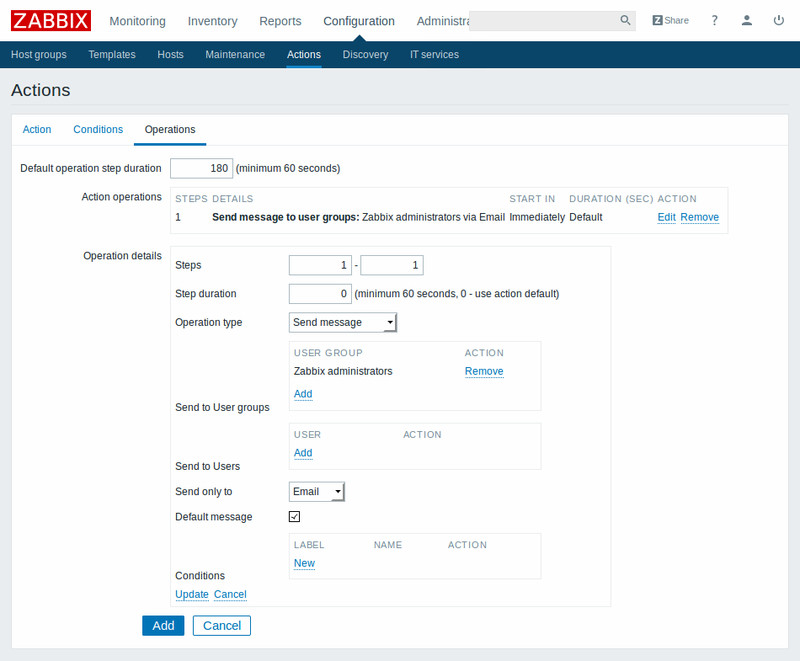 Zabbix web frontend is the feature that sets it apart from other solutions. A powerful, yet easy-to-use official GUI is shipped with the default package. It provides both non-intimidating access for novice users and large scale configuration features for sizable installations. 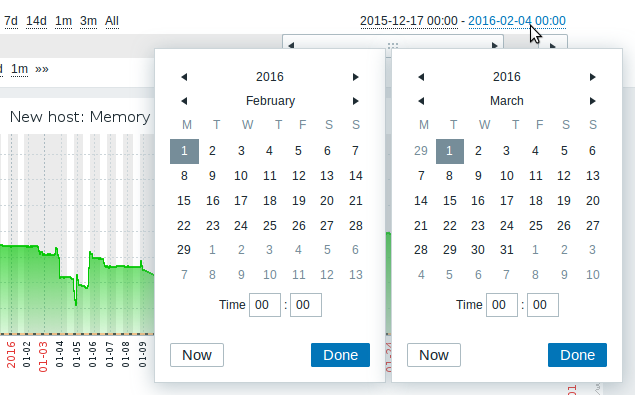 Display as many graphs as required in one screen, automatically refresh them, change the period and so on. 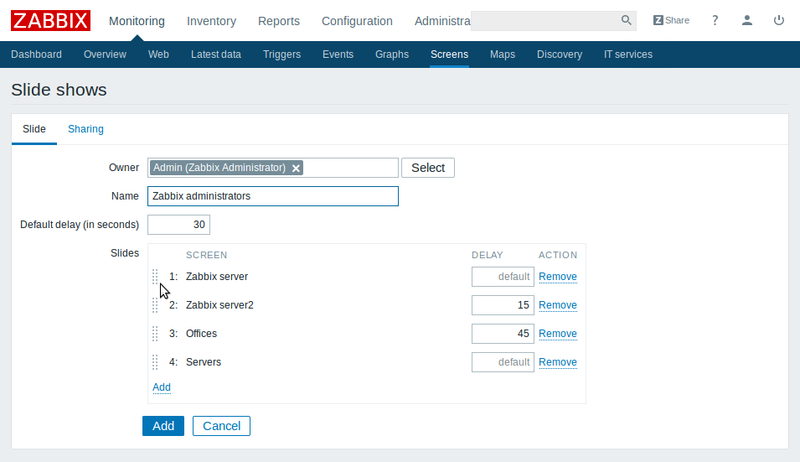 Modify all monitoring configuration using the Zabbix web frontend. No need to learn how to use the console and Unix-like text editors. 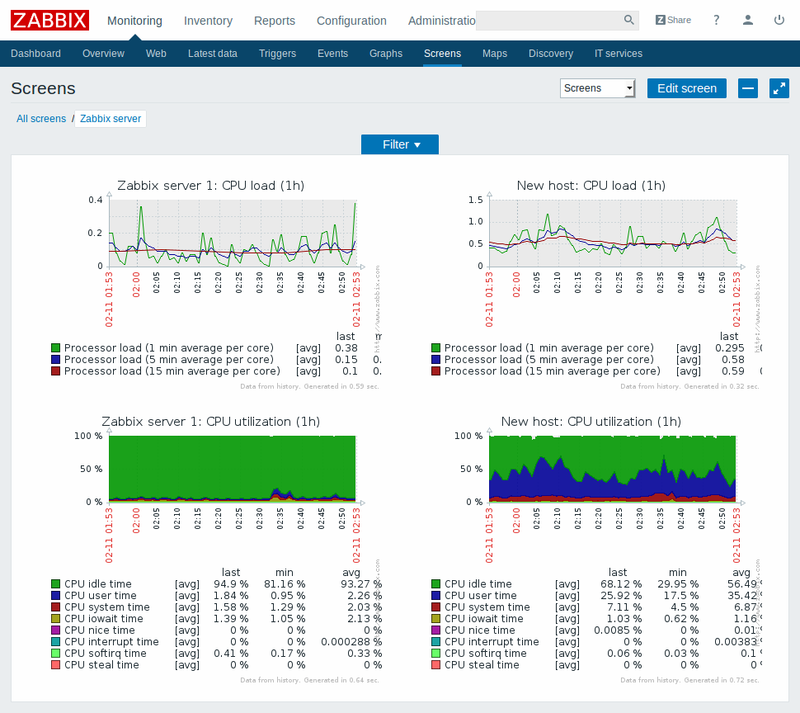 Zabbix web interface offers both the configuration of monitoring and viewing gathered data. A network administrator can see and control everything in one interface. 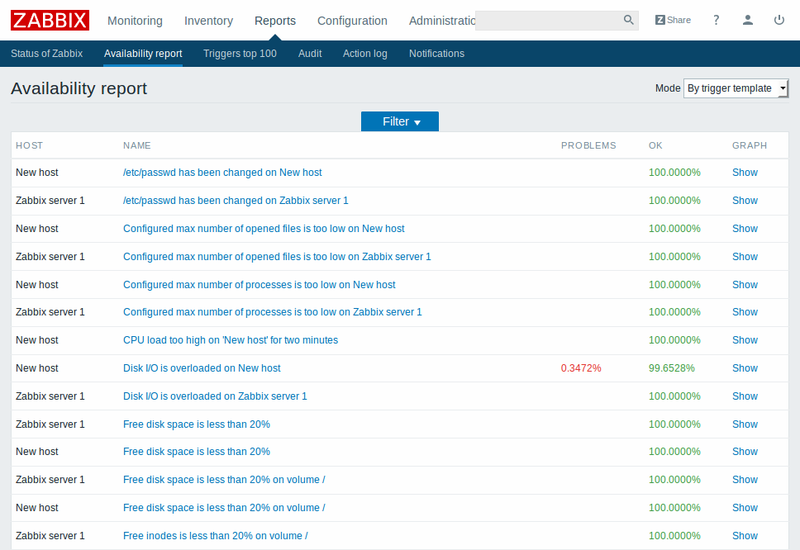 Zabbix web interface offers centralized configuration of all monitoring aspects. The configuration changes become active immediately. Zabbix fully supports Unicode/UTF-8, allowing for a truly localized or multi-language setup. All user operations are recorded. Latest versions of Google Chrome, Mozilla Firefox, Microsoft Internet Explorer and Opera are supported. Other browsers (Konqueror, Apple Safari) may work with Zabbix as well. Global search provides suggestions, based on the entered string. This string is matched against hosts only and all suggestions are case-insensitive. Search results contain matching hosts, host groups and templates. Global notifications display information that may require immediate user attention, regardless of the screen the user is looking at. Global notifications involve both showing a message and playing a sound. Global notifications can be enabled per user in profile configuration. If enabled, global message timeout can be changed. By default, messages will stay on screen for 90 seconds. It is possible to receive messages for problems and for resolutions. Messages can be filtered based on trigger severity as well. For each trigger severity and recovery message sound to be played can be customized. As the messages arrive, they are displayed in a floating section on the right hand side. This section can be repositioned vertically. 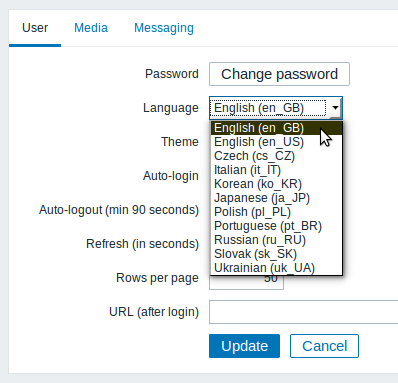 Zabbix web frontend is fully translated into several major languages (Japanese, Russian, Polish, Portuguese, Italian), and the process continues. See full List of localizations available by today. 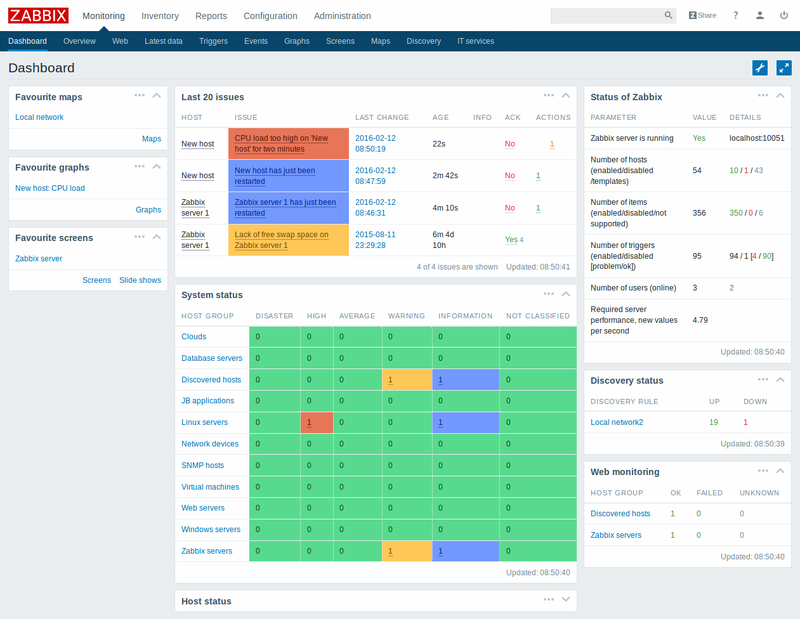 By default, Zabbix web frontend provides a number of predefined themes. Users may create their own themes. 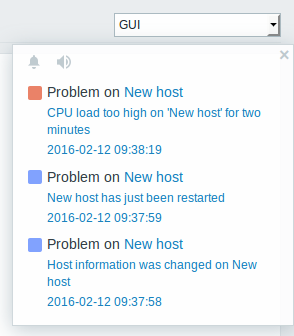 Dashboard can be filtered by host group, trigger severity, problem status and other parameters. Users may customize the dashboard, reallocate widgets with drag-and-drop, add and remove favorites. Zabbix has already data gathered and stored, so it is easy to generate graphs from them. A standard graph for a numeric item is available without any configuration at all - these graphs are generated on runtime. To view such a graph, click on Graph next to any item in Latest data. Controls above the graph allow to change the currently displayed time period. The time period displayed is changed by dragging or resizing the time scrollbar. You can zoom out or zoom into fine details down to one minute. Additionally, links to the left (above the time scrollbar) allow to choose some predefined, often used time periods and move the displayed period forward/backward in time (below the scrollbar). And the dates on the right hand side actually work as links, popping up a calendar and allowing to set a specific start/end time. Custom graphs are more powerful than simple standard graphs. In a custom graph data of several items can be compared and you can specify the graph style or the way lines are displayed. Custom graphs can be created for a host or several hosts or for a single template. Custom graphs, along with a couple of basic reports, allow to look at the data in context. In Zabbix you may create instant ad-hoc graphs for several items. While a simple graph is great for accessing data of one item and custom graphs offer customisation options, none of the two allow to quickly create a comparison graph for multiple items with little effort and no maintenance. 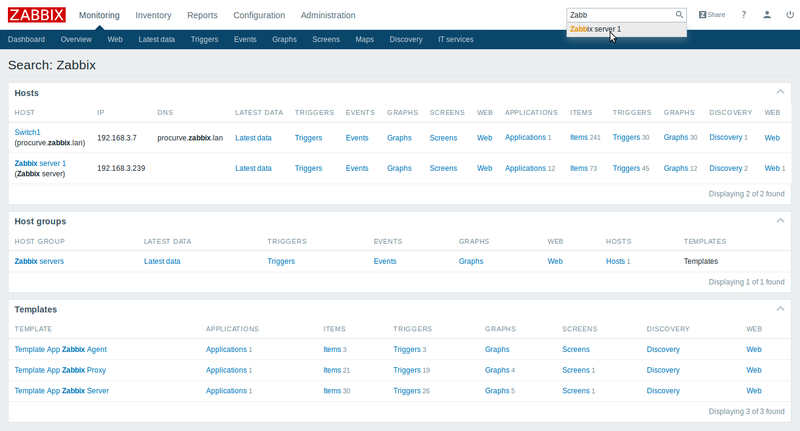 To address this issue it has been made possible in Zabbix to create ad-hoc graphs for several items in a very quick way. Just mark the checkboxes next to desired items and you may have the respective graph created instantly. 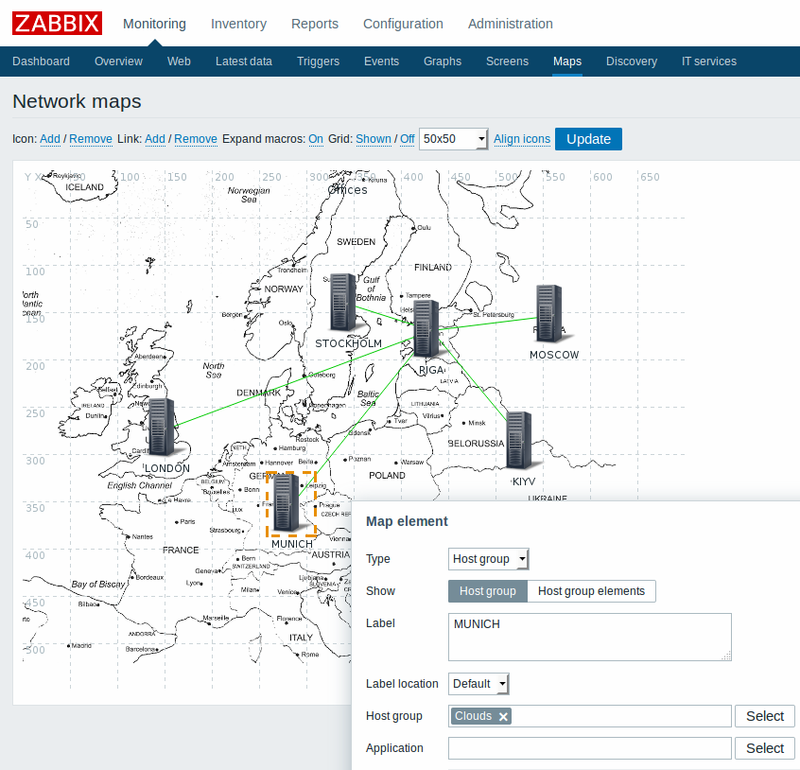 Zabbix network maps offer a possibility of laying out the monitored environment over an optional background image for a user-friendly overview. Each element on the map may represent a host, host group, single trigger, an image or another map. Maps can be created by all system users. Maps can be public and available to all users or private belonging to the owner and shared users/users groups. Map editing in Zabbix has been improved over time by adding drag-and-drop support, whole area selection, as well as selected element detail display in a popup. 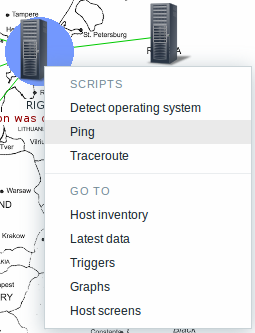 Since map elements can be linked to trigger information, a map can become "alive" starting to display what is going on with the monitored hosts. If some event occurs, icon status and link color on the map are changed automatically. You can see what's happening in the system on the map! Additionally, icon and link descriptions can contain user-defined macros. For example, real-time bandwidth data can be shown in link description, or processor load average can be shown in host description. If you click on a host, you can access some scripts, as well as links to the trigger status page, which will be filtered to provide the list of currently active triggers for the host, and the host screen page. A slide show may rotate several screens (see above), one after another, according to the configured intervals. Screens and slide shows can be created by all system users. Screens and slide shows can be public and available to all users or private belonging to the owner and shared users/users groups.